Re: DETAILED PROCEDUREOF40 DAYS SUGARCANDYSAIPOOJA. HEMALI JI, AS YOU ARE CONFUSED ABOUT SUGAR OR SUGAR CANDY I WOULD LIKE TO SHARE MY EXPERIENCE WITH YOU- I WAS ALSO CONFUSED B'Z WHEN I READ THIS MAIL OF SUBHARSHINI JI I HAD ALREADY STRATED THE BHOG OF "CHANE AND MURMURE" SO I CONTINUED WITH THE SAME. SUBHARSHINI JI IS PERFECTLY RIGHT,BABA GIVES VALUE TO OUR SWEET PRAYERS ONLY. SO GO HEAD WITH YOUR FULL FAITH. TAKE INSPIRATION FROM soundar JI. HE HAS ALSO EXPERIENCED THE PRESENCE OF BABA ON HIS SECOND DAY OF THIS POOJA. "अब तू ही मेरा रेहनुमा,अब तू ही मेरा खुदा है।"
Thanks a lot Subhasriniji. I read it today and going to start this pooja today (thursday)...thanks a lot to you and also to sai..
Good luck and Sai bless and answer all your prayers ASAP. OM SAI SRI SAI JAYA JAYA SAI!!! Let us pray at the feet of Sai Baba who is the incarnation of all gods and protector of all, to show mercy on us, and increase our devotion towards him. A Person, who has controlled his mind, can achieve any success in his life. How far you are trying to control your mind? The mind that judges not others ever remains tension-free. Her help to all of us is indeed your gift to us. Thanks subhasrini ji for sharing such a nice pooja. This is very new to me. Kind words are like the seats in an Airplane. You'll still get to your destination without them , but the journey is a whole lot more comfortable with them. DETAILED PROCEDURE OF 40 DAYS SUGAR CANDY SAI POOJA. 2) YOU HAVE TO OFFER SUGAR CANDY TO SAI FOR 40 DAYS. 3) USUALLY, WE DISTRIBUTE THE NAIVEDYAM(PRASAD) OFFERED IMMEDIATELY, BUT HERE, WE ARE GOING TO COLLECT IT IN A CONTAINER. 5) AFTER OFFERING IT TO SAI, COLLECT THIS IN A CONTAINER. YOU SHOULD NOT EAT IT, DON'T DISTRIBUTE IT ALSO. INSTEAD, KEEP COLLECTING. 6) AFTER 40 DAYS, SAI WILL COME IN SOME FORM & TAKE THE PRASAD FROM YOU. You can do this either in the morning or in the evening. Ladies, do not do it on the forbidden days, continue thereafter. Do everything according to your practice & convenience. But, nothing forms part of this Pooja. Some times, Sai comes even on the second day & takes the Prasad. Sometimes on the 40th day or even after that, do not worry. No hard & fast rules,YOUR FAITH IS REQUIRED SHREE SAI WILL GUIDE YOU. Re: DETAILED PROCEDURE OF 40 DAYS SUGAR CANDY SAI POOJA. i read the details of 40 days sugar candy sai pooja. But i got one doubt. u said that sai will come and take the prasad and not to distribute. If suppose sai has not come in any form in through 40 days, What we should do the sugar candy prasad after 40 days. distribute the same for your friends or neighbour. I did the same . But I am sure Sai will grace you in someway.Have faith and patience. suhasrini ji can u plzzzzzzzz give me the detail of SAINAV VRAT[thursday fast]i shall be thankful. “SAI NAV (NINE) GURUWAR (THURSDAY) VRAT”. Kokilaben and her husband Maheshbhai used to live in a big city and they had lots of love for each other. But Maheshbhai’s nature was very annoying and he had no sense of talking. Neighbors were also very much frustrated by his this kind of nature. Kokilaben had lots of faith in GOD and she was very religious. She was tolerating all her problems silently having lots of faith in GOD that GOD will make everything all right one day. But because of Maheshbhai’s nature, their business went down gradually and there was not enough income. He started staying at home all day and his nature become worst. It was an afternoon. One old saint came to Kokilaben’s door. There was enormous light on his face. And he asked for rice and dal (lentils). Kokilaben gave him rice and dal and she folded her both hands and said “namste” (greetings). Saint replied “SAI will always keep you happy.” Kokilaben said “There is no happiness in my life” and she told all her problems to the saint. Saint told as follows about the Vrat. · This Vrath can be started from any Thursday by uttering SAI BABA’s name. · This Vrath has to be continued for 9 Thursdays. · Any male, female or child can do this Vrat. · On these Nine Thursday, individual who is doing vrat can eat fruit/milk/sweets etc. all day long or can have one meal a day. ONE MUST NOT DO THIS VRAT WITHOUT EATING ANYTHING. · If possible, go to SAI BABA’s temple to have SAIBABA’s darshan on these Nine Thursday. · At home, do pooja / prayer of SAI BABA as follows. · In the morning or in the evening, do the pooja as mentioned below. · Put Yellow Cloth in front of you and place SAI BABA’s Photo or Statue on this cloth. · Light lamp (diya) in front of BABA’s picture. · Wash or wipe BABA’s picture with clean water and cloth. · Put “tikka (Bindi on the forehead)” with “kumkum” (red powder) on BABA’s face. · Offer Yellow Flower to BABA. · Read this SAI story and Read / Sing SAIBABA’s Aarti after finishing Pooja and reading story. · Tell BABA why you are doing this Vrat and ask him to fulfill your wish. · Give Prasad to all your friends and family members and you also eat it some. · If, because of any reason, you cannot do vrat on any Thursday, skip that Thursday and continue from the next Thursday. · If female is doing this Vrat, skip the Thursday during Menstrual Cycle period. 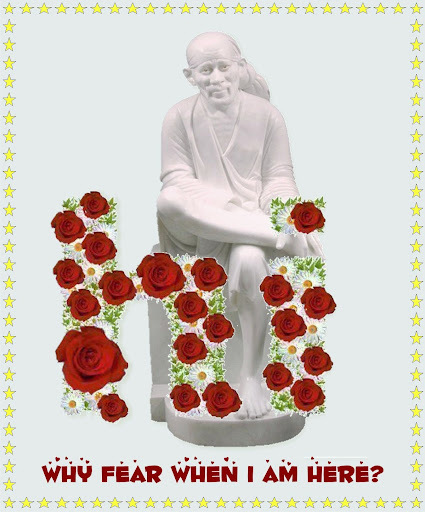 · On the 9th Thursday, Celebrate SAI VRAT. In this celebration process, feed 5 poor people and distribute this SAI VRAT book among people. One can give 5, 11 or 21 etc. · Put this SAI VRAT Story Book or printed paper , which you are going to distribute among people, when you do pooja and then give them to people. By doing this, their wishes will be fulfilled very soon too. · All wishes will be fulfilled by doing this vrat. In this Kali Age (Kaliyug), this vrat is very effective. This vrat will give desired fruit to doer but doer must have full faith and patience. Whoever will distribute this SAI VRAT book among people and make good name of SAI and this Vrat, their all wishes will be fulfilled. After listening about this SAI VRAT from Saint, Kokilaben also decided to do this vrat. She started Vrat from the Thursday. And she finished 8 Guruwars with full faith. On the 9th Guruwar, she fed poor people and distributed SAI VRAT books among friends and relatives. As soon as she finished the Vrat, all the quarrels vanished from her house. Prosperity, happiness and peace spread in her home. Maheshbhai’s nature was changed completely. Their business started doing well. And in no time, they got all the happiness and prosperity. Both husband and wife started living happily. One day Kokilaben’s sister-in-law and brother-in-law came from Surat. Her sister-in-law was talking with Kokilaben. The former said that her kids were not studying and getting failed in exams. Kokilaben told her about SAI VRAT. She said “SAI devotion will make education better. Have faith in SAI BABA. HE helps everyone.” Kokilaben’s sister-in-law asked the detail of the vrat. Kokilaben told about the SAI VRAT in detail. And explained her everything about the vrat. Her sister-in-law went to Surat and she sent a letter after few days. She wrote that her children have started doing SAI VRAT and now they are studying very well. She also did Vrat and distributed SAI VRAT book in her office. One of her friend, who had very hard time in getting married, got married to a very nice man after started doing SAI VRAT. Her neighbor has also started doing SAI VRAT and she got her stolen jewelry box back. It was a great miracle. Hey SAI BABA , as you have blessed these people, please bless all of us too. Contributed by saishuba - shirdi sai bless her. Thanks. the gift of a rich harvest. - Shirdi Sai Baba . i also want to do this vrat but i just want to clarify about the sugar candy.. what exactly is sugar candy? can you name some sweets that can be offerred? and what can be offered as NAIVEDYAM(PRASAD)? I have read detail about this Vrat, I have some query as i am living in U.K and its difficult to find books plus distributing amongst people, could you please advice me what to do in such circumstances on last 9th Thursday please? Do this pooja with full faith and devotion and pray and ask Baba Sai sincerly why you are doing this pooja. With regard to distribution u can send the soft copy of the same to your friends or relatives. I do in this way since I live in USA. Faith and Devotion are more imporatnt don't worry about any other things. I am new here.. i want to do the 9 guruvaar vrat and also 40 days of offering sugar candy. But I have some queries. What exactly is sugar candy? And can you name some NAIVEDYAM(PRASAD) that can be offered? I really really want to do this but till I do not get them cleared I wont be able to so please help me over this? Page created in 0.476 seconds with 69 queries.